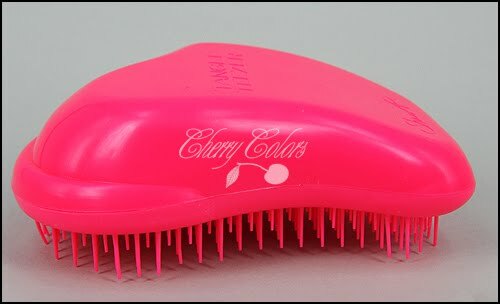 Review: Tangle Teezer - Cherry Colors - Cosmetics Heaven! I was sent this pretty item, a while ago but I wanted to test it for good. I mean, after all, it does promise some wonderful things. 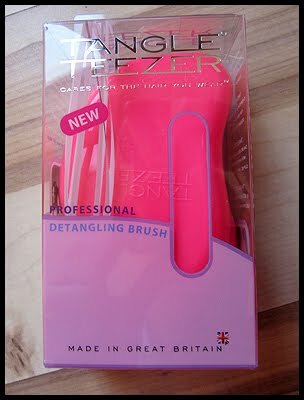 Let me introduce you to Tangle Teezer Original! It came in a transparent box, with a small opening so you could feel the bristles. In my case, I already took it out of the box and forgot to turn it right ._. Anyway, mine is in pink (I love pink) and it looks really great next to my other hair care stuff. There are other colors available too. Before I got it, I used a round brush with natural wild boar hair. I used it because I read so many good stuff on how it's healthy and how it's perfect for my curly and dry hair. It always took a while to get nice and smooth hair. That was with wet hair, and it took even longer with dry hair. Man, that was a true nightmare! I still have those brushes, but I use them only when I blow dry my hair. For everything else Tangle Teezer is perfect! Your perfect hair care partner, Tangle Teezer Original is a gentle pain-free hair detangler that has been referred to as the miracle brush that detangles like nothing else. Its secret is it allows you to manage and style your hair as never before, transforming tangled hair into a stress free, style-able hair and encouraging your hair’s natural shine and thickness to return. Tangle Teezer is the first of a new generation of detangling hairbrushes! Upon picking up Tangle Teezer you will notice the teeth aren’t like that of an ordinary brush which is where the hair genius comes in. The unique configuration of specifically designed teeth flexes just the right amount to detangle and help smooth the hair’s cuticle which in turn protects the inner cortex from damage. Using the Tangle Teezer will ensure your hair will appear more lustrous by minimizing cuticle damage which in turn will help color last and reduce the risk of fading. The hair shaft is also better prepared for the onslaught of damaging heat from styling tools. That’s why we like to call it first aid for hair. It practically sounds like a little miracle tool! Well, what to say¸ for me it definitely worked as one! Usually, I have lots of knots and weird stuff going on my hair, but with this tool, I can make it all go away in less than two minutes. Damn, it's so easy and fast to detangle your hair! And ended with shiny, smooth hair! Niiiice! I usually wouldn't even dare to touch my wavy hair with a brush or comb while they are dry. Not only because it ruins my curls, but because after it I'd always look like I had an afro hair style. Unintentionally of course. I was even afraid of brushing my hair while it was wet. At that time the curly hair is the most vulnerable. So I would brush it gently, from the ends to the roots of the hair. But now I don't worry that much anymore! I was actually pretty scared of using ANY brush before Tangle Teezer, so I'm pretty happy that I found out about it! Oh and look at how much hair got out during that detangling. Those were all parts of different knots. In other occasions, I'd cut my hair simply because the knot would be too big, and nothing would save it. +Lots of different colors to choose from! +It doesn't damage your hair. +It helps your hair to become smooth and nice. +It's great for styling hair. +Helps you get rid of those annoying knots! +It looks very stylish compared to other brushes. -The bristles could bend while traveling (need to store it properly) or harsh use. Overall: This is one of these items that you will have for a very long time so for the money is well worth it. It will help your hair too, which will make you love it even more! I adore it, and I'm pretty happy that I got it from the company. If I wouldn't, I know I would buy it myself! The price is very affordable if you buy it from the official page. I did hear that a site from my country sells them for so much you'd want to cry. I saw them going for 20€ each. Omg! So if you can buy online do get them from the official page, it's so much cheaper and you will know it's the original too! Plus their shipping is cheap too! I do always bring it along with me whenever I go, and even my boyfriend isn't scared of brushing my hair with it (usually he hated the noise of 'tearing' hair when he runs into a know) since it does it job in silence. I do highly recommend it to everyone!